20 million classifications and counting! Planet Hunters has just crossed the 20 million classification mark, a milestone to be celebrated! Thinking back to this time three years ago, the the Zooniverse development team and Planet Hunters science team were hard at work on the design and building of the site. We didn’t know if people would come to the website to help find planets by reviewing Kepler light curves; we were showing graphs of a star’s brightness over time, not the beautiful galaxies in the stunning images on Galaxy Zoo. Since the day the project launched in December 2010, we’ve been blown away by the response. It’s been truly overwhelming. 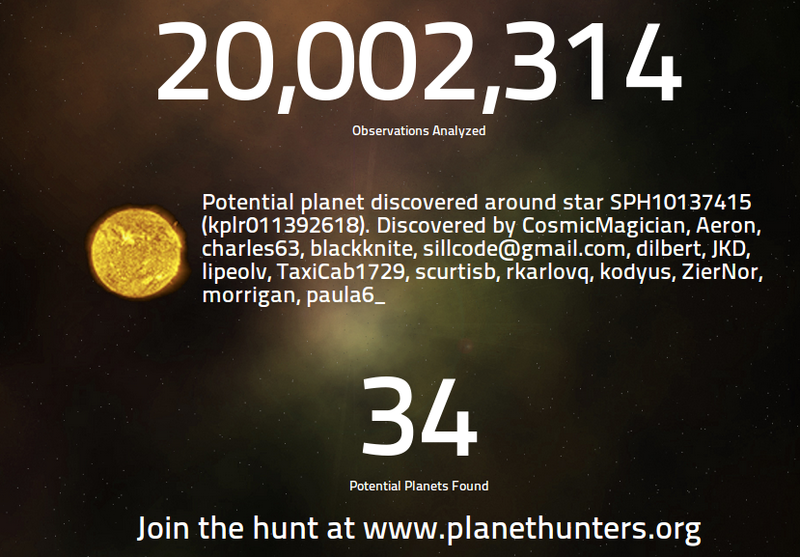 I know I couldn’t have comprehended reaching 20 million classifications back then, and here were are with over 260,000 volunteers worldwide participating in Planet Hunters! A big thank you to the Planet Hunters community, to all of you who have contributed to the project. Thank you for your time, hard work, and dedication. With your help, Planet Hunters has discovered more than 30 planet candidates, a seven planet solar system, and two confirmed planets: PH1 b, a transiting circumbinary planet in a quadruple star system, and PH2 b, a confirmed Jupiter-sized planet in the habitable zone of a Sun-like star. Your classifications and efforts have resulted in 6 published papers and our 7th paper was just recently submitted to a scientific journal and currently in review. The science team is currently working hard on several new papers, and we’re looking forward to sharing the results with you in the coming months. On to the next 20 million classifications and to uncovering the discoveries awaiting in the Kepler light curves! Keep the clicks coming at http://www.planethunters.org .